The new leader of the PP party in Andalucia, Juan Ignacio Zoido, and the President of the Junta de Andalucia, PSOE José Antonio Griñán, have sat down together for their first official meeting, and have produced an agreement to “stop squabbling” and work together to save Andalucia. 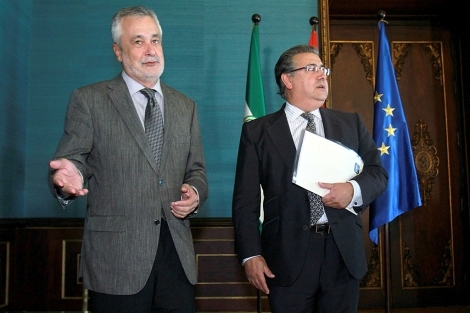 Zoido told reporters that although there are many unanswered questions, and many disputes, between the two political parties, the PP in Andalucia (PP-A) must be realistic and understand that the PSOE control (in coalition with the IU) the regional parliament. As such, the PP will order its members at all levels, from townhalls up to Parliament, to engage with their political opponents and work together for the greater good. The PP control all the major towns in Andalucia, and a number of the provinces, meaning that they can oppose a lot of the orders of the Junta de Andalucía. As a symbol of good faith, both leaders have announced that they will drop all arguments against the naming of a new leader of the FAMP, the Andalucian Federation of townhalls and provinces, which is a major step forwards, and will sit down this week to jointly elect a new leader. The PP have also agreed to permit the passing of the Andalucian budget, dropping threats to block it in parliament. “We may not agree with all points, but we all agree that we need a budget” said Zoido, who added that not blocking the passage of the bill was not the same as agreeing with all of its points. Zoido has also agreed to talk with the national Minister for the Economy to offer the PP-A’s aid in helping Andalucia offload 4 billion euros in debt. The region has been allowed to issue up to 4 billion euros worth of debt on the international markets, but so far has failed to sell any of it, mainly due to in-fighting between different government departments. It’s a surprising piece of realpolitik and it should be interesting to see how long this lasts. This entry was posted in Blog and tagged algriculture, grianan, pp, psoe, zoido by David. Bookmark the permalink.